The robe of our 2012 Marinus is very deeply-colored. The aromas exude beautifully ripened red fruits accented by subtle spice notes. The mouthfeel is very soft and full expressing delicious flavors of ripe cherry and plum. The finish is well structured with soft tannins promising a long life for this superb bottle, similar to a fine Bordeaux. 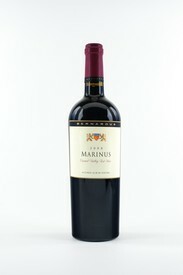 The robe of our 2011 Marinus is a very deeply-colored ruby-red. The aromas express beautiful red fruits accented by classic notes of cedar and spices. The delicious flavors are very dense and full, with spicy black cherry and ripe plum flavors. The finish is very well structured, promising a long life for this superb bottle, similar to a fine Bordeaux.